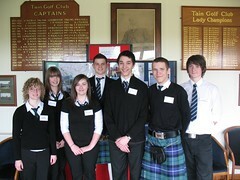 Some of the current and prospective Gold Duke of Edinburgh pupils are pictured here waiting to meet Prince Edward. Gairloch staff and pupils were invited by Highland Council representatives to attend a function at Tain Golf Club along with groups from Fortrose and Tain. Each group mounted a display and had a chance to chat to the Earl of Wessex about their DofE exploits and adventures. Details of the full visit can be read here on the Highland Council website. Click here for some more photos. Easter Study Club -As a change from usual, Easter Study Club took part in the second week of the holiday this year because of the early holiday. 56 pupils from S4,5 & 6 (over half of the pupils in the upper school) attended sessions in English, Maths, Chemistry, Physics, Music, German and Art over a period of three days. Pupils felt the benefit of the extra tuition they were able to receive within the relaxed atmosphere of the Study Club and teachers appreciate the fact that so many of our pupils are willing to give up part of their holiday to this end. However, all were in agreement that the highlight of each day was, undoubtedly, the wonderful lunch provided by Strath Stores! Thanks to the staff also who were able to give their time to support this. Let’s hope the pupils are still putting in those extra hours studying. Exams are looming in the next few weeks and the pressure is on! Global Teacher – Dr Caley has been successful in an application to take part in a trip to Africa over the summer. She is one of a group of 14 teachers from across Scotland travelling to Malawi as a Global Teacher to assist in the development of cultural links as well as offering professional support to the school that she visits. The trip is organised by the international charity Link Community Development (LCD). We will give more information on this trip in the next issue and beyond but this is a great achievement. This expedition will provide many opportunities for the pupils in Primary and Secondary to become involved and more aware of world issues. Human Papilloma Virus – Vaccination programme – Plans are in progress through NHS to implement a vaccination programme for all girls in S2. This will help reduce the number of cases of Cervical Cancer. More details will follow prior to the programme taking place in school after the summer holidays. Plans also exist over the next two years to include older girls still in school starting initially with those currently in S4 and S5 followed by those currently in S2 and S3. Modern Studies Higher Pupil conference – On Wednesday 9th of April Anna MacLean, Morag MacIver and Rosie Norman, travelled with Ms Velt to Inverness to attend a conference that was organised to help prepare pupils in the Highlands for their Modern Studies exam. The pupils attended various workshops on specific study themes and listened to very valuable advice from members of the SQA team who write the Modern Studies exam papers. Overall, it was a very successful day. The speakers all commented on the positive and mature attitude of the participants, and with the support and encouragement of many Modern Studies teachers in the Highlands, this will hopefully become an annual event. S5 pupil Martin MacLeod completed his SVQ Level 1 course in professional cookery at Inverness College before the holidays. Martin has been traveling through a day each week to take part and this culminated in the preparation and presentation of a lunch for invited guests. Ross Lister and Derek Martin have been involved in a fifteen week training course to achieve a certificate in Sports Diving. Derek said, “The course included some theory lessons on how to maintain your kit, about signals and surface drills and how to treat decompression sickness. There was also a practical part to the course learning basic moves and first aid.” Well done to both boys for achieving this certificate. Judith Mathieson and Flora Stevens have been selected to take part in training for the Great Britain Handball team. Well done to both of them for achieving selection at the highest standard. We look forward to hearing how they get on. Callum Croal entered the International Chemistry Olympiad for UK Sixth Form pupils and achieved a Gold standard award – the highest available. This UK wide event was organised by the Royal Society of Chemistry. Callum has also achieved success in another area of his studies. He has been awarded a pass in an Open University Course offered in school with the support of Highland Council. Callum chosen course was Introductory Astronomy. Last weekend Hamish Laing, Joseph Powell, Conal McDonagh and Charlie Mays travelled with other Two Lochs young presenters across the sea to Skye in the RHIB, Orca 1. 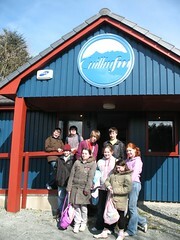 They were involved in presenting a special radio programme from the Cuillin FM studio in Portree. The boys were very professional and did a great job along with the other 5 young presenters putting on a two hour live show for Cuillin FM and Two Lochs. The crossing in the morning was fairly calm and Skye presented some beautiful spring weather – however the return trip was bumpy to say the least! Read more here and see some photos. School Meals – The prices were increased to £1.85 for a standard meal as of April 7th 2008. Great Wilderness Challenge funding – Gairloch High School pupils have been fortunate again, this year, to be the recipients of funding from the Great Wilderness Challenge Committee. The money (£3750) will be used to purchase mountain bikes and supporting equipment to assist in the development of our Outdoor Education courses in S3 and S5/6 and Duke of Edinburgh’s Award expeditions. Currently equipment is hired from Muir of Ord and having our own will increase opportunities dramatically whilst reducing costs. We are very grateful for this funding which will support our efforts to encourage active lifestyles and general fitness in our pupils. See photos of last year’s big bike trip here. 4 Gairloch High School pupils and 5 younger children travelled to Portree on Orca 1 to present a 2 hour programme simultaneously on Cuillin FM and Two Lochs Radio. The trip resulted from strong links that have developed between the two stations and supported, on this occasion, by a grant provided by the Youthlink Scotland and The Highland Council. It was a great trip and everyone was impressed by both the hospitality received and the Cuillin FM set up. The radio programme was aired live and sounded great! Well done to all the staff at Two Lochs and Cuillin FM for the planning and execution of this event. Also to Fiona Downie for helping gain the supporting funds. The trip had been postponed previously due to bad weather and until we encountered a choppy sea on the return journey it was a perfect day! Click on the photo for more pictures.